Shopping for a new Toyota Sienna? The 2019 Toyota Sienna minivan may seem familiar. That’s because it hasn’t been significantly changed since 2010. For 2019, the Sienna gets some minor updates to keep it in the thick of the minivan market to hold on for at least one more model year before a full redesign. The sportier-looking and firmer-riding Sienna SE trim offers all-wheel drive for the first time, making the four-season option available in the LE, SE, XLE, and Limited trims. The Sienna also adds Apple CarPlay and Amazon Alexa capability, but not Android Auto. One of the Sienna’s strongest suits is its standard active safety technology, which bundles adaptive cruise control, active lane control, forward-collision warnings with automatic emergency braking, and automatic high-beam headlights together on every trim level. Other competitors are catching on, but Toyota has the honor of saying it was first. Styling updated last year carries over for 2019, including a gaping front bumper that’s mostly grille (or at least appears to be). The sportier Sienna SE side panels still adorn every model this year.s far as minivans go, this one is an attention-grabber. Powertrain options remain the same, in that there’s really only two to choose from. 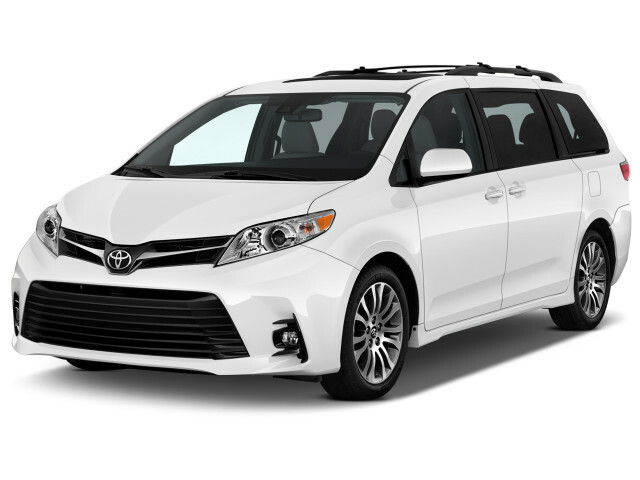 You can have your Sienna with either front- or all-wheel drive in every trim level except the base L model, and all versions come with a 3.5-liter V-6 that makes 296 horsepower and uses an 8-speed automatic geared to improve fuel economy. With an available 7 or 8 seats, the Sienna packs 164 cubic feet of passenger space, and with the seats removed, it can hold several 4-by-8 sheets of plywood on the load floor. In terms of family-friendly options, there’s a loudspeaker that lets you project your voice to those pesky kids in the back, and you can have a Blu-ray player fitted to keep them entertained in the first place. The 2019 Toyota Sienna is oddly styled. After 8 years with minimal changes, designers deserve at least some credit for trying to keep the 2019 Toyota Sienna fresh, even if the results are not particularly pretty. The 2019 version receives no visual updates as the thorough refresh came just last year, so the big grille and sloping headlights stay as well as basically the same rear end that’s been around since 2011. You’ll certainly be able to spot the 2019 Sienna if you’ve ever seen a Sienna before, but it fails to stand out despite its striking,questionable design elements. Opting for the sportier SE model adds some side skirts and unique front-and-rear bumpers, as well as clear taillights and bigger wheels, though they’re downgraded to 18 inches from 19 inches last year. At least ride quality improves with the taller sidewalls. Inside, it’s more of the same as well, as last year a new sweeping dashboard design was installed that incorporates the standard 6.1-inch touchscreen for infotainment. Opt for one of the higher-trim Siennas, and you’ll also get an integrated 4.2-inch instrument cluster screen for more information right in the driver’s view. Decent V-6 power and the option for all-wheel drive keep the 2019 Toyota Sienna’s powertrain relevant. With a respectable 296 horsepower, the 3.5-liter V-6 that comes as standard on the Sienna is matched with an 8-speed automatic transmission and either front- or all-wheel drive, the latter of which is now available on almost all trim levels minus the base one. Solid power from the stalwart engine and smooth shifting make for a relaxed driving experience, though the gearbox is a bit hesitant to downshift a gear or two for highway merging. In terms of steering, the thick wheel implies a degree of sportiness that the Sienna just doesn’t match. Light steering effort doesn’t betray accuracy. Though not as quiet as some of its competitors inside, the Sienna is still a comfortable ride, though the stiffer suspension of the sportier SE model does predictably make for a bouncier affair. However, the 19-inch wheels on last year’s SE are gone in favor of 18-inch examples with all-wheel drive, so the extra inch of sidewall should help make things a bit more comfortable. Despite its stiffness, the SE doesn’t feel much more competent on a curvy road, though this is a minivan after all. As it stands, the Sienna is still your only option if you want an all-wheel-drive minivan, which does give it a significant advantage over competitors in states with wintry weather. Even 8 years on, the 2019 Toyota Sienna is still an exceptional people and stuff hauler. Though its rivals have it beat on freshness, the 2019 Toyota Sienna is still a very comfortable and capable minivan option thanks to ample space and a highly configurable cabin. The 2019 Sienna rings in at 119.3 inches between the axles, and over 200 inches in total length, making for 164.4 cubic feet of passenger space, more than enough for hauling eight occupants in comfort (or seven with the optional second-row captains chairs). 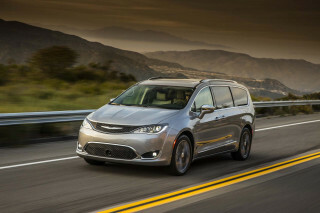 Unfortunately, the seats do no stow away like in the Chrysler Pacifica, so if you’re planning on hauling things other than people, you’ll have to take all of the seats out and store them elsewhere. Those who opt for the top-tier Limited trim get reclining second row seats with leg cushion extenders and foot rests, but there’s not hot towel service or complimentary champagne to speak of. The third row is decent for adults, even three people across, and is easily accessed, especially between the two central chairs. Folding the third row flat and pushing the second row forward makes for 118 cubic feet of cargo space, and with all of the seats removed behind the front row, you’ll have 150 cubes to work with. Behind the third row, there’s still 39.1 cubic feet, so the Sienna will swallow a few suitcases if you’ve got a full load of passengers on board. Excellent crash-avoidance technology but concerning crash test scores make the 2019 Toyota Sienna a mixed bag when it comes to safety. 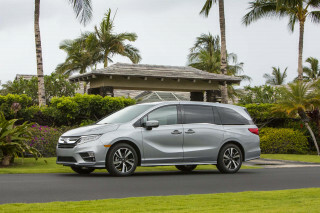 In a recent test from the IIHS, the Toyota Sienna placed last among three minivans, including the Honda Odyssey and Chrysler Pacifica, and was the only one not to receive a Top Safety Pick award for the 2018 model. This is due to an “Acceptable” overall score in driver side tests, and a “Marginal” overall score for passenger side tests, including “Poor” for structure on that side. While Toyota updated the driver side to conform to the relatively new small front overlap test, the passenger side received no such structural updates, and the results are concerning. However, the Sienna did receive “Good” scores all around otherwise, and a “Superior” rating for its front crash prevention technology. 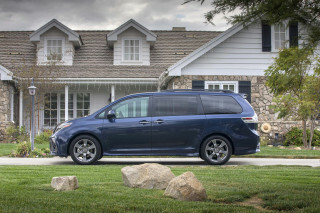 The NHTSA rates the Sienna at five stars overall, albeit with four stars for side impact and four stars for rollover. Standard active safety gear includes adaptive cruise control, active lane control, forward-collision warnings with automatic emergency braking, and automatic high-beam headlights on every trim level, something most competitors cannot claim, coupled with its concerning crash test scores, the Sienna can’t be considered better than middle-of-the-road when it comes to safety, however. Minivan buyers will find almost every feature they could want or need in the 2019 Toyota Sienna. Available in L, LE, XLE, SE, and Limited trims, there’s no shortage of Siennas to choose from, and thanks to a standard 6.1-inch infotainment system that now comes with Apple CarPlay and Amazon Alexa functionality, Toyota’s stalwart van becomes a bit more modern. Opting for the basic L trim gets you very few features but does include the aforementioned infotainment system and standard active safety features. There are also five USB ports scattered throughout the cabin, so most occupants can keep their precious mobile devices charged at all time. The next-to-base LE is most popular is fitted with dual power sliding doors, a power driver’s seat, and special stain-resistant cloth upholstery. 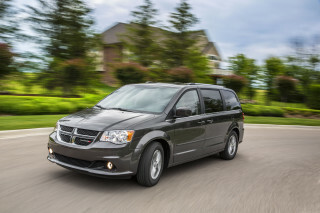 Opting for the XLE adds leather, a power moonroof, and a power passenger’s seat, while the top-tier Limited nets a power-folding third-row bench and a loudspeaker system that projects the driver’s voice to the rear of the vehicle. 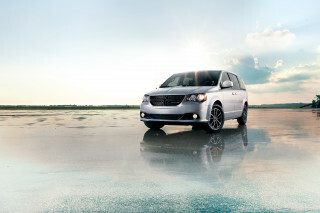 A sportier-looking SE trim includes a stiffer suspension, as well as unique interior and exterior styling but fewer features than the Limited model. The optional rear seat infotainment system offers wireless streaming for Android devices, though curiously, Android Auto smartphone projection is not an option. The 2019 Toyota Sienna manages fuel economy on par with its V-6 counterparts, though suffers a bit with all-wheel drive. 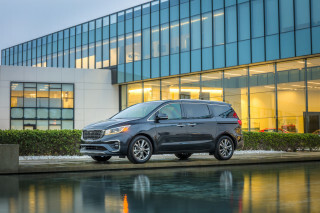 A 3.5-liter V-6 and 8-speed automatic are the only engine and gearbox option, but the Sienna is the only minivan to offer all-wheel drive, which does predictably affect fuel economy. The EPA rates the 2019 Sienna at 19 mpg city, 27 highway, and 22 combined for front-wheel-drive models. Those figures drop to 18/24/20 mpg with all-wheel drive equipped on all trims except the base L model. Strangely, there is no hybrid Sienna available despite Toyota’s penchant for adding the technology to almost all of its vehicles, so the more efficient Chrysler Pacifica Plug-In Hybrid still takes top honors in the class, but both the V-6 Pacifica and Honda Odyssey manage 22 mpg combined as well.